The only validated measure of surgeon’s knowledge and skills related to the most widely performed surgeries in the world. With more than one million minimally invasive surgeries performed annually, SAGES and ACS also recommend that institutions credentialing surgeons to perform laparoscopic surgery consider FLS certification as a requirement of their credentialing process. The Society of American Gastrointestinal and Endoscopic Surgeons (SAGES) and the American College of Surgeons (ACS) today announced the recommendation that all surgeons practicing laparoscopic surgery be certified through The Fundamentals of Laparoscopic Surgery™ Program (FLS). FLS is the only validated, objective measure of a surgeon’s fundamental knowledge and skills related to laparoscopic surgical procedures. FLS was developed to ensure that every surgeon practicing laparoscopic surgery has the minimum knowledge, judgment, and technical skills that form the basis for safe performance of these procedures. FLS was designed to be independent of specialty area and procedure type. The goal of the curriculum is to provide a strong foundation for practice. Beginning with the 2009-10 academic year, the American Board of Surgery (ABS) required that all general surgery residents successfully complete the FLS exam to be eligible to take the ABS Qualifying Exam in Surgery. FLS was modeled after the American College of Surgeons Advanced Trauma Life Support (ATLS) program with a didactic and hands-on component. One of the unique features of the FLS program is the robust evaluation for both the didactic and psychomotor skills consistent with the standards for high-stakes examination. It will be published in the May issue of the Bulletin of the American College of Surgeons. 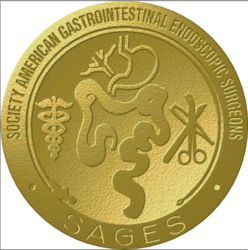 SAGES, Society of American Gastrointestinal Endoscopic Surgeons, is a nonprofit organization of surgeons founded in 1981 and is a worldwide community of surgeons who bring minimal access surgery, endoscopy, and emerging techniques to patients in every country. SAGES’ mission is to provide leadership in surgery, particularly gastrointestinal and endoscopic surgery, to optimize patient care through education, research, and innovation. The American College of Surgeons is a scientific and educational organization of surgeons that was founded in 1913 to raise the standards of surgical practice and to improve the care of the surgical patient. The College is dedicated to the ethical and competent practice of surgery. Its achievements have significantly influenced the course of scientific surgery in America and have established it as an important advocate for all surgical patients. The College has more than 78,000 members and is the largest organization of surgeons in the world. Launched in 2004, FLS is the first surgical assessment tool to be mandated by the American Board of Surgery in order to set the standard for safe laparoscopic surgery.